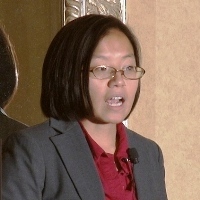 MeiMei Johnson, DVM, recaps a case from the DoveLewis ICU of a young dog presenting with respiratory distress after assumedly ingesting anticoagulant rodenticide. Blood transfusion guidelines are also discussed. A seven-year-old, 6.3kg, spayed female Border Terrier was referred to DoveLewis for evaluation of pleural effusion and coagulopathy. She had originally presented to her primary veterinarian earlier in the day due to a 24-hour history of lethargy and coughing. She was assessed and found to have pale gums, HR of 160bpm, RR of 60 with increased respiratory effort and a BP of 108mmHg systolic. Blood work was performed that revealed anemia with a hematocrit of 19.6, hypoproteinemia with a total protein of 4.7, thrombocytopenia with a platelet count of 120,000 and leukocytosis with a WBC of 24,500. Thoracic radiographs were performed that revealed pleural effusion. The combination of anemia, decreased protein and pleural effusion increased the index of suspicion for hemorrhage. A coagulation panel was submitted at that time. Her clotting times were elevated with an OSPT of >100 seconds (normal 9-12 seconds) and an APTT of 132 seconds (normal 59-87 seconds). She was referred at that time for continued care including a blood transfusion. Historically, she had been healthy with no known exposure to rodenticide or other toxins. She did frequent parks and it is possible she could have ingested something while there. Upon presentation to the ER at DoveLewis, the dog was found to have muffled heart and lung sounds ventrally in addition to her tachycardia and tachypnea. Thoracic auscultation also revealed harsh lung sounds dorsally with a few crackles heard. Flow by oxygen was started at the time of admit, and she was given 30mg vitamin K1 SQ in the event that this was a rodenticide coagulopathy. Additional diagnostics were performed, including a baseline PCV/TS (25/5.0) and blood type (DEA 1.1 +). A FAST scan revealed a moderate amount of pleural effusion, but no free abdominal or pericardial fluid was seen. She was transferred to our ICU to start her transfusion at that time. Due to her dyspnea, she was placed in 40% oxygen. She was then administered half of a matched unit of packed RBCs (pRBC) and fresh plasma (FFP) over a four hour period without any evidence of transfusion reaction. Approximately one hour post transfusion, her clotting times were nearly normal with an OSPT of 14 seconds (9-12) and an APTT of 82 seconds (59-87). Her PCV/TS was 34/4.2. Clotting times and PCV/TS were rechecked 18 hours post transfusion and remained stable with OSPT of 11 seconds and PCV/TS of 34/6.2. She required oxygen therapy for an additional 24 hours, allowing time for pulmonary infiltrates and pleural effusion to resolve. Oxygen was then weaned as her SpO2 without O2 supplementation improved and she was breathing with less effort. She was discharged on a four week course of vitamin K1 within 36 hours of initial presentation. Although there was no definitive proof, this patient was treated as an anti-coagulant rodenticide toxicity. When caught early this can be a very simple toxicity to treat, but if enough time passes without treatment (3-4 days), consequences can be dire and treatment becomes more extensive (and more expensive). 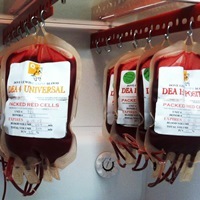 It is a case in which transfusion medicine is a crucial part of treatment. This is the main focus of this case study; however, below is a review of the other facets of treatment. If ingestion was within 4-5 hours, induce vomiting to minimize dose. Vitamin K1 at 2.5-5mg/kg q24h x 3-4 weeks for most second generation rodenticides. Recheck clotting times within 2-3 days of finishing vitamin K therapy. Check clotting times: If within normal limits then the amount ingested may have be less than the toxic dose. The options discussed should include: no therapy with recheck clotting times within a few days vs. starting vitamin K therapy as recommended above.If clotting times are elevated, a plasma transfusion is recommended (fresh or fresh frozen plasma). Recheck clotting times with plasma administered up to every 6 hours until clotting times normalize.If there is concurrent anemia, transfusion with pRBCs is recommended as needed. Initiate vitamin K1 therapy as above. Recheck clotting times 2-3 days following cessation of vitamin K1 therapy. Other possible therapies include oxygen supplementation and appropriate centesis as needed. In this case, and other similar cases, we do not pursue thoracocentesis unless there is significant respiratory distress. The hope is that the body will autotransfuse and regain the RBCs lost into the body cavity involved. If thoracocentesis is necessary, then this blood can be re-transfused as necessary. This blood should be mixed with an anticoagulant such as ACD at a ratio of 1ml ACD to 7-8ml of blood. This will minimize the formation of micro-fibrin clots. One concern when removing this blood from the chest or other body cavity is that the space will simply refill with more blood with nothing gained. Transfusion with plasma and/or RBCs is not something that is performed regularly in general practice and can be a bit daunting to team members. These patients are often referred for transfusion. Although this is ideal, some clients are unable or unwilling to pursue referral. In these cases, in-clinic transfusion becomes imperative and can be lifesaving. I am hoping to simplify this process and set some minds at ease. Once you have identified a patient for a transfusion in your hospital, what do you do? The first step is to determine where you will get the blood. An established blood bank is going to be the easiest and best source. They will often provide the supplies and instructions needed. Additionally, blood banks usually have rigorous donor screening so that you are not causing more harm with the blood you are transfusing. Local blood banks will blood type for you and provide the appropriate filters and IV lines for administration. There is also an administration worksheet so that you can determine how much to give and how to administer and monitor the transfusion. A canine blood unit is usually approximately 350-450ml. Units can often be split in half or thirds to get an appropriate volume for your patient. This can be performed by the blood bank for a splitting fee prior to picking up the blood. The additional aliquots of blood will be sent and can be administered later if needed. Once split, however, the blood should be administered within 24 hours to avoid contamination. All blood products must be administered through a blood filter. This can be provided by the blood bank providing the blood. The patient’s regular IV fluids should be stopped, or run through a separate IV catheter than the blood product to avoid adverse effects on the red blood cells being transfused. Once this is done, the transfusion can be started. The rate should be started slowly at 1ml/kg for the first 30 minutes with the goal being to administer the entire volume within four hours. Any transfusion lasting longer than four hours can put the blood at risk of contamination. If the transfusion is going well after 30 minutes, the rate can be incrementally increased to as high of a rate as the patient can safely tolerate. Monitoring involves obtaining a TPR every 15 minutes for the first hour then hourly after that time. If the patient is going to have a reaction, it is most likely to occur during the first hour. If the patient has a reaction, the most common sign is an increase in temperature and sometimes an increase in respiratory rate. If this occurs, decrease the rate by approximately half, administer diphenhydramine IM at 2.2mg/kg and recheck the temperature within 15 minutes. If there is no improvement, a steroid can be administered (i.e. Dexamethasone SP at 0.2mg/kg IV). If the temperature has improved after 15 minutes, you can attempt increasing the rate again. Occasionally patients will only tolerate a lower rate and will get a suboptimal volume within the four hour period. If the patient remains febrile then the transfusion may need to be stopped. Patients with autoimmune causes for their anemia are more likely to react to their transfusions. Sometimes, this possibility can be decreased in these patients by crossmatching the donor to the recipient. This can be requested at most blood banks with the blood type. Once the transfusion is finished, the patients IV fluids can be restarted and the PCV/TS and/or clotting times can be rechecked within an hour. The process, from start to finish, generally takes about five hours with the first hour being the most intensive.